Held over two days, the Burnley Town Centre Event, Charter Walk’s Summer Garden Party was a series of fun, free activities. Due to its close ties to the community, Charter Walk acted as a central hub for these activities. Activities included an exclusive meet and greet meal with the public’s favourite children literature character, Spider-Man (as voted for by an online competition). The Burnley Town Centre Event also hosted a series of picnic sites with food provided by the centre’s eateries and a ‘Fairy and Pixie’ training school. The events were a hit with shoppers with many praising the range of activities available that suit everyone. As part of the Summer Garden Party Event the centre held a workshop around the Budding Burnley initiative, a green community focused campaign. The aim was to revitalise a previously sparse area of the mall as well as strengthening the centre’s ties to the community. As part of the scheme a community allotment was opened, made up of vegetable beds and giant flower pots. 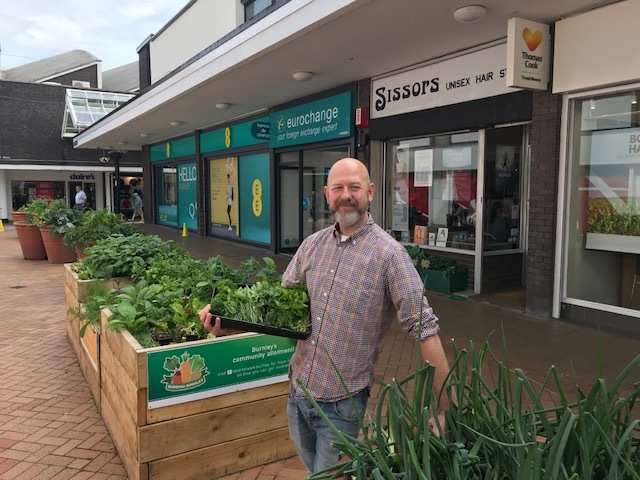 Since then a team of volunteers from the local community have been responsible for planting and maintaining a variety of vegetables and herbs. The team meet hourly, twice a week to tend to the crops. Budding Burnley also have their own kids club, called Pollen Partners. When the produce is fully grown, each harvest will be donated to local food banks and community cafes. The reaction to the allotment was incredibly positive. Many of the community praised the scheme for providing them with something unique they can interact with and take pride in.